Specification of the germ line is an essential event during the embryonic development of sexually reproducing animals, as germ line cells are uniquely capable of giving rise to the next generation. Animal germ cells arise through either inheritance of a specialized, maternally supplied cytoplasm called 'germ plasm’ or though inductive signaling by somatic cells. Our understanding of germ cell determination is based largely on a small number of model organisms. To better understand the evolution of germ cell specification, we are investigating this process in the amphipod crustacean Parhyale hawaiensis. Experimental evidence from previous studies demonstrated that Parhyale germ cells are specified through inheritance of a maternally supplied cytoplasmic determinant; however, this determinant has not been identified. Here we show that the one-cell stage Parhyale embryo has a distinct cytoplasmic region that can be identified by morphology as well as the localization of germ line-associated RNAs. Removal of this cytoplasmic region results in a loss of embryonic germ cells, supporting the hypothesis that it is required for specification of the germ line. Surprisingly, we found that removal of this distinct cytoplasm also results in aberrant somatic cell behaviors, as embryos fail to gastrulate. Parhyale hawaiensis embryos have a specialized cytoplasm that is required for specification of the germ line. Our data provide the first functional evidence of a putative germ plasm in a crustacean and provide the basis for comparative functional analysis of germ plasm formation within non-insect arthropods. A key event during the development of sexually reproducing organisms is the formation of germ cells, the cells that ultimately give rise to the next generation. In all sexually reproducing animals that have been examined, germ cells are specified by inheritance of a specialized cytoplasm called 'germ plasm’ or though zygotic induction by somatic cells. Although the inheritance of germ plasm is widespread amongst metazoans, only three phyla (rotifers, nematodes and chaetognaths) appear to be entirely characterized by this mechanism of germ cell specification, and it is hypothesized that germ plasm evolved independently many times during evolution . Interestingly, despite the evolutionary novelty of germ plasm within different phyla, germ plasm shares many conserved features amongst species [2–6]. Germ plasm is characteristically yolk-free and non-membrane bound, with a concentration of mitochondria and maternally deposited RNAs that are often associated with organelles called germinal granules [6, 7]. In all species examined, germ plasm contains products of the vasa gene, a conserved ATP-dependent helicase [8, 9]. The first functional tests of germ plasm were performed on chrysomelid beetle embryos by Hegner in 1908 when he removed the posteriorly localized germ plasm and observed that the embryos developed without germ cells [10, 11]. In 1974, Illmensee and Mahowald performed seminal experiments using Drosophila and transplanted germ plasm from the posterior pole to the anterior and lateral regions of the embryo to produce ectopic germ cells, thereby demonstrating the sufficiency of germ plasm for germ line specification . A recent study in which ectopic germ cells were induced by transplantation of germ plasm in Xenopus demonstrated that germ plasm is sufficient to determine germ cells in a vertebrate . Thus, it has been shown that for some members of both vertebrate and invertebrate phyla, inheritance of germ plasm is both necessary and sufficient for germ line specification. The Arthropoda is the largest and most diverse animal phylum; however, our knowledge of the mechanisms of arthropod germ plasm formation derive almost exclusively from a single species, Drosophila melanogaster. In Drosophila, germ cell formation is dependent on the germ plasm nucleator Oskar, a novel protein that is only found in insects [14, 15]. In addition, Drosophila germ cells form as pole cells at the posterior of the embryo, a feature unique to holometabolous insects  (but see  for data from a thrips). Identification of primordial germ cells in crustaceans has been based almost exclusively on cytological analysis and expression of the germ line marker vasa. Although evidence exists by these criteria for the presence of germ plasm in several species (for example [18, 19]), functional analyses to test the necessity and sufficiency of a cytoplasmic determinant for germ cell specification have not been performed in a crustacean. To gain a broader understanding of the mechanisms of germ line development in arthropods, we are using the amphipod crustacean Parhyale hawaiensis to study the process of germ cell specification. Parhyale embryos undergo holoblastic cleavages, and in wild type embryos cell fate is thought to be determined by cell lineage [20, 21]. The first three cleavages in Parhyale result in an embryo with four macromeres and four micromeres. The four macromeres give rise to the anterior and visceral mesoderm (Mav), the right anterior ectoderm (Er), the left anterior ectoderm (El) and the posterior ectoderm (Ep). The micromeres give rise to the germ line (g), the right trunk mesoderm (mr), the left trunk mesoderm (ml) and the endoderm (en) . Although some somatic cell fates are capable of regulative replacement at late stages of embryogenesis , blastomere isolation and ablation experiments have shown that, consistent with the results of lineage tracing studies [20, 23], early cell fates appear to be determined autonomously at least through gastrulation [21, 23, 24]. This early restriction of fates suggests that the earliest cleavages are polarized and may effect asymmetric distribution of maternal cell fate determinants. Germ cells can be distinguished by the presence of high levels of vasa transcript and protein [21, 25]. Lineage tracing as well as blastomere isolation experiments have demonstrated that the g micromere is the exclusive source of germ line cells in Parhyale[20, 21]. Blastomere isolation experiments, in which individual blastomeres of the eight-cell embryo were isolated, cultured and assayed for Vasa expression, also provided evidence for the existence of an inherited cytoplasmic determinant, but did not specifically identify this determinant . In this study, we report the presence of a distinct cytoplasmic region in the one-cell Parhyale embryo that is required for specification of the germ line. We show that this cytoplasmic region contains conserved germ line transcripts, and that when this region is removed, the embryo develops without germ cells, consistent with a function as germ plasm. Surprisingly, this specialized cytoplasm also appears to be required for additional aspects of somatic cell fate, as embryos in which the cytoplasm has been removed appear to have defects in polarity and die prior to gastrulation. This work provides the first functional analysis of a putative germ plasm in a crustacean. Parhyale hawaiensis adults were cultured in artificial seawater (Instant Ocean) with crushed coral at 28°C. Animals were fed daily with ground aquaculture feed (40% TetraPond® wheat germ sticks, 40% TetraMin® flake food and 20% Tropical® spirulina). Gravid females were anesthetized with CO2 and embryos were collected as previously described . Embryos were fixed by incubation in 3.7% formaldehyde in 1× PBS for 2 minutes at 75°C followed by 20 minutes in 3.7% formaldehyde at 4°C. Membranes were then dissected from embryos in PBS and the embryos were fixed overnight at 4°C in 3.7% formaldehyde in 1× PBS. One-cell embryos were fixed when the RNA-containing body was clearly visible using incident illumination. Some embryos were stained with 10 nM SYTOX Green (Invitrogen). Whole mount in situ hybridization on Parhyale embryos was performed as described in  with the following modifications. Prior to rehydration, the embryos were cleared by incubation in xylene for 20 minutes. Following post-fixation, the embryos were incubated in detergent solution (1.0% sodium dodecyl sulfate (SDS), 0.5% Tween, 50.0 mM Tris–HCl (pH 7.5), 1.0 mM Ethylenediaminetetraacetic acid (EDTA; pH 8.0), 150.0 mM NaCl) for 30 minutes and then fixed again in 3.7% formaldehyde for 30 minutes. Hybridization was performed at 66°C or 67°C. After hybridization, the embryos were washed twice in 2× saline sodium citrate (SSC) for 30 minutes and then twice in 0.2× SSC for 30 minutes. Probes were visualized using NBT/BCIP (Sigma). Embryos were stained with 5 μg/ml Hoechst 33342 (Sigma). Sense probe controls showed no labeling (data not shown). Images were captured with an AxioCam MRm camera using AxioVision (Zeiss) and processed using Adobe Photoshop, Helicon Focus and ImageJ. Total RNA was isolated from the ovaries of adult Parhyale females using Trizol (Invitrogen) and used for first-strand cDNA synthesis with the SuperScript III 1st Strand Synthesis Kit (Invitrogen). Parhyale orb and germ cell-less orthologs were identified using sequences deposited in ASGARD  and primers for RT-PCR were designed using Primer3. cDNA fragments were cloned into the pCR4-TOPO vector (Invitrogen). Sense and anti-sense digoxygenin (DIG) labeled probes were transcribed using T3 and T7 polymerases. Primers for cloning a 2505-bp fragment of vasa cDNA were based on a published sequence (Accession no. EU289291 ). Sense and anti-sense vasa probes were transcribed using T3 and T7 polymerases. The RNA-containing body (RCB) was removed from one-cell embryos approximately 2 hours after fertilization when it was clearly visible with incident illumination. To remove the RCB, an embryo was placed in a drop of filtered sterile seawater on a Sylgard silicone plate. The embryo was held with forceps and pierced with a glass needle in the center of the RCB. The embryo was then gently squeezed and the RCB and surrounding cytoplasm were extruded from the embryo. Control embryos were pierced with a glass needle at a random position approximately 100 μm away from the RCB along the long axis of the egg, and the embryos were gently squeezed so that the amount of non-RCB cytoplasm extruded from the control embryos was comparable to the amount of RCB cytoplasm removed from the experimental embryos. The embryos were then transferred to a dish of sterile filtered artificial seawater containing 100 units/ml penicillin, 100 μg/ml streptomycin and 1 μg/ml amphotericin and allowed to develop at 28°C. Any embryos that had not started to divide within 6 hours of ablation were assumed to be unfertilized and were discarded. Of the remaining embryos, 100% developed to the germ disc stage. Live images were captured with an AxioCam MRm camera using AxioVision (Zeiss). The embryos were illuminated with incident cold light and maintained at a temperature of 25°C in sterile artificial seawater. Scoring of g blastomere identity was confirmed by blind scoring by colleagues. Supplementary movies were edited using ImageJ and QuickTime Pro. To characterize the expression of a set of germ line-associated genes, we examined their expression patterns by in situ hybridization in one-, two-, four- and eight-cell embryos. We found that transcripts of three such genes were localized to a distinct cortical cytoplasmic region in the one-cell embryo. The first gene, vasa, encodes an ATP-dependent RNA helicase and is a highly conserved germ line marker found in the germ plasm of all animals examined [1, 8, 29]. We examined the localization of Parhyale vasa mRNA by in situ hybridization and found that vasa transcripts are localized to a distinct cytoplasmic region at the cortex of one-cell embryos (Figure 1A, arrowhead; n = 17/17). In addition, as previously described, the transcript is localized around the nucleus of the embryo . The transcript remains localized to the cortical cytoplasmic region as mitotic cell division begins, but by the two-cell stage, vasa transcripts can no longer be detected at the cortex and are only found surrounding the nuclei (Figure 1B). We also examined vasa expression in four- and eight-cell embryos, but consistent with previous observations , we only saw transcript localized around the cell nuclei and did not observe localization of vasa transcript to any other distinct cytoplasmic region in the g micromere or any of the other blastomeres (Figure 1C). Germ line-associated RNAs localize to a distinct cortical cytoplasmic region in one-cell embryos. (A–C) vasa transcript localization. (A) In one-cell embryos, vasa is localized to a distinct cytoplasmic region at the cortex of the embryo (arrowhead) and to the cytoplasm surrounding the nucleus. (B) In two-cell and (C) eight-cell embryos, vasa transcripts are predominantly localized to the cytoplasm surrounding the nuclei and are no longer seen in a distinct cortical domain. (D–F) gcl transcript localization. (D) Like vasa, gcl is localized to a distinct cortical cytoplasmic domain in one-cell embryos (arrowhead). (E,F) In all stages subsequent to the first cell division, gcl transcripts are only detected surrounding the nuclei. (G-I) orb transcript localization. (G) Similar to vasa and gcl, orb transcripts are localized to a distinct cytoplasmic region at the cortex of one-cell embryos (arrowhead) as well as to the cytoplasm surrounding the nucleus. (H,I) Following cell division, orb transcripts are predominantly localized to the cytoplasm surrounding the nuclei. Scale bar: 200 μm (all panels). We next examined the expression of germ cell-less (gcl), a conserved BTB-domain (BTB: BR-C, ttk and bab) gene that localizes to germ plasm in Drosophila. We found that gcl transcripts are also localized to a distinct cytoplasmic region at the cortex of one-cell Parhyale embryos (Figure 1D, arrowhead), and like vasa, the transcript can only be detected surrounding the nuclei after the first cell division (Figures 1E,F). Finally, we examined the expression of the Parhyale ortholog of orb, a cytoplasmic polyadenylation element binding protein that is localized to the germ plasm in Drosophila[31, 32]. Like vasa and gcl, orb transcripts are localized to a cortical cytoplasmic region in one-cell embryos (Figure 1G, arrowhead), as well as around the nucleus, but after the first cell division, are only detected surrounding the nuclei of blastomeres (Figures 1H,I). In situ hybridization using sense probes for vasa, gcl and orb produced no signal, indicating that the cortical cytoplasmic region is not a non-specific attractor of labelled RNAs. In addition, we did not observe any staining in one-cell embryos using antisense probes for the zygotically expressed genes cap-n-collar and spineless, which label appendage primordia later in development (data not shown; P Sharma and TG, unpublished work) and play a role in somatic, but not germ line, development in other arthropods [33, 34]. Taken together, these data indicate that there is a distinct cytoplasmic region in the one-cell embryo that is rich in germ line RNAs. Because of the accumulation of RNA localized to this region, we will hereafter refer to this distinct cytoplasmic region as the RNA-containing body (RCB). The cortex of the one-cell Parhyale embryo is uniform in appearance with the exception of a cytoplasmic region that is more refringent under incident light than the surrounding cytoplasm (Figure 2A). This cytoplasmic region is first detectable as a diffuse white spot, which then forms a ring that can also be seen using incident illumination (Figure 2B) and Nomarski optics (data not shown) as a yolk-free area surrounded by a ring of small granules. We and others (M Modrell, M Gerberding and N Patel, personal communication) hypothesized that this cytoplasmic region may function as germ plasm in the specification of the germ line. Examination of the in situ hybridization data described above using Nomarski optics confirmed that the RCB corresponds to this refringent cytoplasmic region (Figure 2C). The localization of several germ line transcripts to this region further supports the hypothesis that it functions as germ plasm. The in situ hybridization staining also revealed that the cell cortex is slightly concave at the position of the RCB, and that the RCB itself is wider at the cortex and then tapers to form a rounded cone shape (Figure 2D). To our knowledge, this morphology has not been previously reported for the germ plasm of any species and its potential significance is not clear. One-cell Parhyale embryos have a distinct cortical cytoplasmic region that corresponds to the RCB. (A) Following fertilization, a diffuse white spot that is more refractive than the surrounding cytoplasm appears at the cortex of the one-cell embryo (arrow). (B) The cortical cytoplasmic domain develops a ring-like appearance visible under incident illumination, with a yolk-free cytoplasmic area surrounded by small granules. (C) vasa transcripts are localized to the RCB, which corresponds to the distinct cortical cytoplasmic domain in (A). (D) A lateral view of vasa staining shows the concave shape of the cortex at the position of the RCB and the cone-shaped morphology of the RCB itself (arrowhead). (E) The nucleic acid dye SYTOX Green weakly labels the RCB (arrow) and strongly labels the polar bodies (arrowhead) showing that the RCB can first be detected on the vegetal side of the embryo, opposite the polar bodies. Scale bar: (B) 50 μm (C) 25 μm (D) 50 μm (E) 100 μm. RCB, RNA-containing body. To investigate the characteristics of the RCB further, we stained Parhyale embryos with SYTOX Green, a nucleic acid dye with a high affinity for both DNA and RNA. SYTOX Green labels the polar bodies (Figure 2E, arrowhead) as well as the RCB (Figure 2E, arrow), consistent with the presence of a high concentration of germ line-associated RNAs in the RCB. 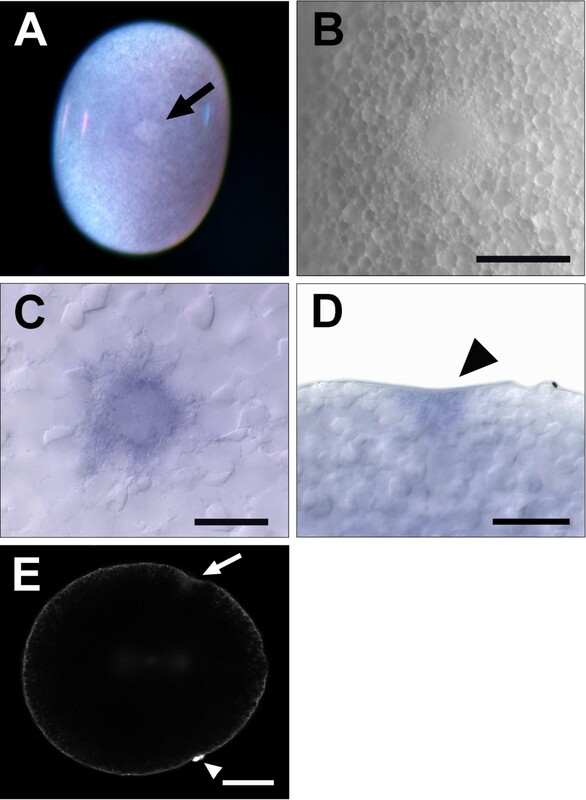 Parhyale embryos display an obvious animal-vegetal polarity upon fertilization, with the polar bodies localized at the animal pole of the egg . We observed that the RCB was generally positioned at the center of the long axis of the egg but was occasionally found asymmetrically positioned along this axis. However, it was always observed on the vegetal side of the egg, opposite the polar bodies, which mark the animal pole (Figure 2E). We then analyzed the movement of the RCB using live imaging with incident illumination and found that just prior to the first mitotic division, this region changes morphology as the small granules that compose the ring coalesce and the yolk-free region moves below the cortex (Additional file 1). The RCB is usually at or very close to the position of the first cleavage furrow and is often enveloped within the cleavage furrow during cytokinesis (Additional file 1). In a small number of embryos where the RCB was asymmetrically positioned along the long axis of the embryo, the RCB remained at the cortex of the embryo until the second cleavage, at which point it was enveloped by the cleavage furrow and was no longer visible (Additional file 2). Asymmetric segregation of the RCB to the g blastomere would be consistent with a germ plasm function. However, due to its subcortical position after the first division, we were not able to follow it past the first cleavage using light microscopy. We hypothesized that if the RCB functions as germ plasm, removing it should result in a loss of germ line specification. To test this hypothesis, we physically removed it at the one-cell stage by poking a small hole in the embryo at the center of the RCB and then gently squeezing the cytoplasm out. Control embryos were pierced at a spot about 100 μm from the RCB along the long axis of the embryo. Similar amounts of cytoplasm were removed from all embryos. In the eight-cell embryo, the g micromere is specified as the exclusive source of the germ line, and it can be identified by the following morphological characteristics: it is the smallest micromere; it is the sister cell of the smallest macromere (Mav); and it does not contact the opposing micromere (en) . We found that when we removed the RCB, the morphology of the blastomeres was altered so that identification of g was ambiguous, while control embryos appeared wild-type and the g blastomere could be easily identified. g can also be identified based on the timing of its division. In wild-type embryos, the first three divisions that result in the eight-cell embryo are synchronous, while the fourth division is asynchronous, with g dividing after the other seven blastomeres . We found that in 82% of control embryos (n = 11), g divided 8 to 37 minutes after the other micromeres (Figure 3A, red data points in C; Additional file 3). This is comparable to wild-type embryos, where it was reported that cleavage of g was delayed 10 to 60 minutes in 88% of embryos . 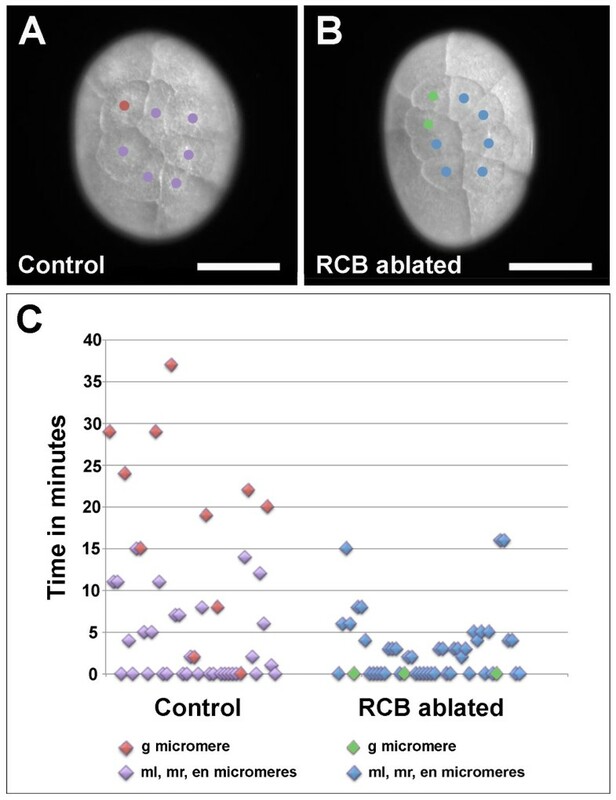 These data indicate that removal of cytoplasm from a random position close to the RCB does not affect micromere morphology or the timing of micromere divisions. We then examined embryos in which the RCB had been removed, and we found that the timing of cell division was altered so that in 100% of embryos (n = 12), all of the micromeres divided within 16 minutes of one another (Figure 3B,C; Additional file 3). In 75% of these embryos, the micromeres all divided within 5 minutes of one another, essentially dividing synchronously. In 3 of the 12 RCB-ablated embryos, the morphology of one of the blastomeres at the eight-cell stage was consistent with that of a g micromere. However, these micromeres did not divide later than the other micromeres (Figure 3C, green data points). The cell division delay that is stereotypical of the g blastomere is lost in RCB-ablated embryos. (A-B) Still images from time-lapse recordings just subsequent to the fourth mitotic division. (A) Control embryo in which cytoplasm was removed from a spot approximately 100 μm from the RCB. Division of the g blastomere (red) is delayed with respect to the other micromeres (purple), which have already divided. (B) RCB-ablated embryo in which the g micromere (green) divided with the other micromeres (blue). (C) Scatter plot showing time points of the fourth mitotic division for individual micromeres. For control embryos, the g micromere is marked in red and the ml, mr and en micromeres are labeled with purple. For RCB-ablated embryos, micromeres with morphology consistent with that of g are marked with green and the ml, mr and en micromeres are labeled with blue. For RCB-ablated embryos in which g was not unambiguously identifiable based on morphology, all micromeres are marked in blue. In control embryos, division of g is generally delayed with respect to the other micromeres, while in RCB-ablated embryos, this delay in division is not observed. Scale bar: 200 μm (A and B) en, endoderm; g, germ line; ml, left trunk mesoderm; mr, right trunk mesoderm; RCB, RNA-containing body. To determine directly whether germ cells are specified in RCB-ablated embryos, we used the germ line marker vasa to examine germ disc stage embryos for the presence of primordial germ cells [21, 25]. In 100% of wild-type embryos, four to nine vasa-positive cells were present 20 to 24 hours after egg-laying (n = 25; Figure 4A,B). In contrast, when the RCB was removed, 97% of embryos had no vasa-positive cells (n = 32/33; Figure 4C,D). Taken together, these data support the hypothesis that the RCB is required for specification of the germ line, as the g micromere and its descendants cannot be unambiguously identified in RCB-ablated embryos based on characteristic morphology, timing of division or vasa expression. vasa-positive cells are absent in RCB-ablated embryos. 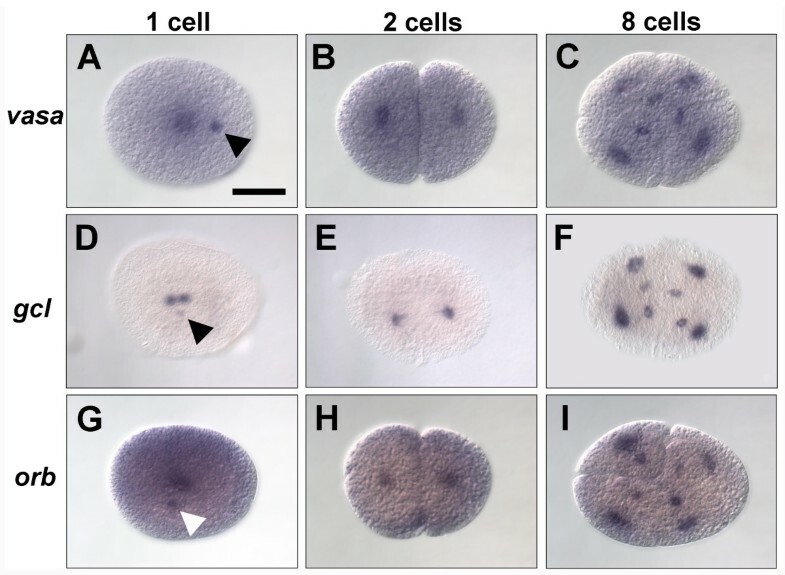 (A,B) Wild-type control embryos. (A) vasa is expressed in primordial germ cells in a wild-type embryo at the early germ disc stage (arrow). (B) False-colored vasa in situ hybridization (pink) with Hoechst to label the nuclei (white). (C,D) RCB-ablated embryos. (C) vasa expression is not seen in a germ disc stage embryo, although Hoechst staining (D) shows that a germ disc has formed. Scale bar: 200 μm (all panels). RCB, RNA-containing body. Previous studies demonstrated that when the g blastomere is ablated at the eight-cell stage, the embryo develops normally but lacks germ cells [21, M Modrell, M Gerberding and N Patel, personal communication]. Surprisingly, we found that when the RCB is removed, 100% of embryos were unable to undergo gastrulation (n > 50). In wild-type embryos, the first cells to undergo gastrulation are descendants of g and its sister macromere Mav [36, 37]. 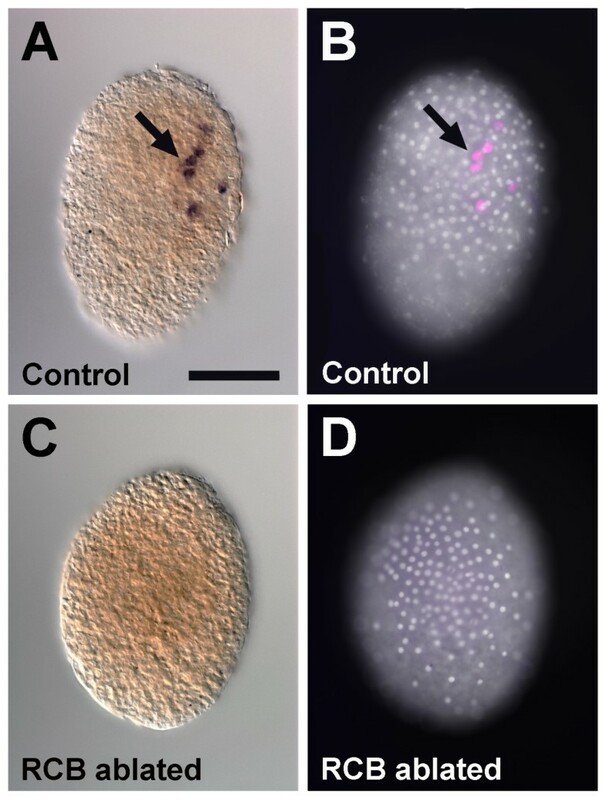 Prior to gastrulation, these cells form a cluster called a rosette, which has a stereotyped clonal composition and can be identified by its distinct morphology (Figure 5A, arrow; Additional file 4). We examined RCB-ablated embryos and found that the rosette structure does not form (n = 42; Figure 5B; Additional file 4), in contrast to control embryos, which undergo normal rosette formation and gastrulation (n = 10; Figure 5A; Additional file 4). The failure of the rosette to form in RCB-ablated embryos cannot be due to the absence of g descendant cells, since it has been demonstrated that when g is ablated at the eight-cell stage, a rosette consisting of Mav, ml and mr descendant cells still forms and the embryo undergoes normal gastrulation movements . Following rosette formation, the cells of control embryos condense to form a germ disc at the anterior pole of the embryo (Figure 5C, arrowhead). In RCB-ablated embryos, a germ disc forms, but it remains in the middle of the embryo rather than moving to the anterior end (Figure 5D). Formation of a germ disc indicates that some cell movements still occur normally in RCB-ablated embryos; however, the behavior of the somatic Mav cells, which do not form a rosette or ingress, is affected. RCB-ablated embryos do not form a rosette and display a defect in anterior-posterior polarity. (A–D) Still images from time-lapse movies of embryos developing from eight cells to early germ disc. (A) A control embryo in which cytoplasm was removed from a spot approximately 100 μm from the RCB. At stage 7, descendants of the Mav macromere and ml, mr and g micromeres form a rosette structure (arrow). (B) In stage 7 RCB-ablated embryos, a rosette structure does not form. (C) During stage 8, control embryos form a germ disc at the anterior end of the embryo (arrowhead). (D) Stage 8 RCB-ablated embryos form a germ disc, but it does not move to the anterior of the embryo; instead the germ disc remains at the center. Scale bar: 100 μm (all panels). RCB, RNA-containing body. Studies of germ line development in the model organisms Drosophila, Caenorhabditis elegans, Xenopus and zebrafish have demonstrated that a range of phylogenetically distant metazoan species utilize inheritance of maternally supplied cytoplasmic determinants to specify germ cells. Analyses of germ plasm formation in these organisms have provided us with a fundamental knowledge of this mode of germ cell specification [1, 6, 8, 29]. Similarities in the molecular composition of germ plasm between these species are striking given the diversity of their developmental mechanisms and the hypothesized independent evolution of this mode of specification . There are essential differences as well, however, including the molecular mechanisms of germ plasm nucleation and assembly, which are still not well understood even in model systems . To understand the evolution of germ plasm, a comparative approach using a broader phylogenetic representation of organisms will be valuable. To this end, we investigated germ line specification in the emerging model crustacean Parhyale hawaiensis. In this study, we identify a distinct cytoplasmic region in the one-cell stage embryo that we term the RNA-containing body (RCB) and describe characteristics and functions of the RCB that are consistent with that of germ plasm. We found that the RCB can first be detected at the vegetal cortex of the embryo, which is where the germ line and mesendodermal lineages arise . Unlike in Drosophila, where the posteriorly localized germ plasm is assembled during oogenesis, the RCB in Parhyale can first be detected following fertilization. The Parhyale embryo is transcriptionally quiescent until at least the 32-cell stage [36, 38]; therefore, the process of germ plasm assembly must be maternally regulated, consistent with that of other model organisms. Although the mechanism by which RCB assembly occurs is not known, the invariant position of the RCB on the vegetal side of the embryo suggests that the egg may be polarized before fertilization, and an unidentified nucleator of the RCB may be localized to the future vegetal cortex during oogenesis. Alternatively, embryonic polarity may be determined by the point of sperm entry as in C. elegans, an organism in which the germ plasm assembles at the posterior of the embryo after fertilization [39, 40]. Since we currently do not have information on the mechanism of sperm entry in Parhyale, it is not possible to distinguish between these alternatives. The RCB can be identified by light microscopy as a yolk-free cytoplasmic region at the cortex of the egg. Using incident illumination and live imaging, we followed the movement of the RCB during the first embryonic cleavages. We found that the RCB is usually at or very close to the position of the first cleavage furrow and is often enveloped within the cleavage furrow during cytokinesis. In a small number of embryos where the RCB was asymmetrically positioned along the long axis of the embryo, the RCB remained at the cortex of the embryo until the second cleavage, at which point it was enveloped by the cleavage furrow and was no longer visible. Our data suggest that the RCB functions as a germ cell determinant, and therefore, we presume that it is inherited by the g blastomere, although we were not able to confirm this by light microscopy. A marker that allows live imaging of the RCB by confocal microscopy may prove useful in confirming the position of the RCB in the eight-cell embryo. A structure similar to the RCB has not, to our knowledge, been described for other amphipod crustaceans. However, the RCB has striking similarities to a structure found in multiple penaeid shrimp species called the intracellular body (ICB) [19, 41–43]. The ICB is an RNA-rich structure that was first identified in Penaeus monodon and hypothesized to function as a putative germ granule . In penaeid shrimp, a single ICB is detectable in the D blastomere of four-cell embryos and segregates to one of two mesendoderm cells [19, 41]. The descendants of one of these mesendoderm cells is hypothesized to give rise to the germ line [44–47]. Like the RCB, the ICB localizes to the cell cortex. Interestingly, an indentation of the plasma membrane adjacent to the ICB has been observed in Marsupenaeus japonicus embryos , which may be similar to the concave membrane morphology observed at the position of the RCB in Parhyale. Future comparative analyses will be useful in investigating the origin and function of these structures in Crustacea. Perhaps the best characterized aspect of germ plasm is the presence of maternally supplied RNA transcripts that are essential for germ cell formation . The gene that has been most widely used to identify germ plasm as well as primordial germ cells in multiple organisms is the DEAD-box RNA helicase vasa[1, 8, 9]. Although not previously reported in a study of Parhyale vasa expression , we found that vasa transcripts are localized to the RCB in Parhyale, consistent with the localization of vasa to the germ plasm in other organisms. The function of Parhyale vasa was previously investigated using translation-blocking morpholino knock-downs, and it was found that vasa is required for the proliferation and maintenance of germ cells but not for their establishment . These authors were not able to detect Vasa protein in germ cells until the onset of gastrulation, consistent with the morpholino phenotype. A previous study, however, reported the presence of low levels of Vasa protein in the g micromere of the eight-cell embryo, suggesting a possible function for vasa in specification of the germ line lineage . The discrepancy between these two studies with respect to the timing of the first Vasa protein expression in germ cells may be due to the fact that these studies used two different cross-reactive anti-Vasa antibodies, raised against Vasa epitopes from a fish and an insect, respectively. To determine whether or not vasa functions to specify the germ line earlier in development, it will be necessary to eliminate vasa transcripts prior to or at the eight-cell stage. The knock-down of a maternal transcript as early as the eight-cell stage was recently reported using an siRNA . Therefore, it may now be possible to investigate an earlier function for vasa using this reagent. The presence of three germ line-associated transcripts (vasa, orb and gcl) in the RCB is consistent with a germ plasm function for this cytoplasmic region. However, if the RCB is asymmetrically segregated to the germ line during the first three cleavages, we might also expect these transcripts to localize to the ancestor cells of the g blastomere at the two- and four-cell stages and then to be enriched in g at the eight-cell stage. We suggest two possible explanations for why we do not observe this: (1) The transcripts that we examined in the RCB may be translated and subsequently degraded at the one-cell stage, and the proteins rather than the transcripts inherited by the g blastomere. (2) The transcripts may be present in the RCB at the two-, four- and eight-cell stages but are undetectable in the RCB by in situ hybridization due to their altered levels or intracellular localization. High concentrations of all three transcripts are found surrounding the nucleus of all blastomeres during early cleavage stages. It is thus possible that after the two-cell stage, when the RCB is no longer at the cortex, the RCB-associated transcripts become indistinguishable from those surrounding the nucleus. We hypothesized that the RCB is a specialized cytoplasmic region that is required for germ cell specification in Parhyale. To test the function of the RCB, we manually removed this cytoplasmic region and examined embryos for the presence of primordial germ cells by assaying for vasa expression, which is restricted to descendants of the g blastomere beginning at the 64-cell stage . As predicted, we were unable to detect vasa-expressing cells in RCB-ablated embryos, demonstrating that the RCB is required for the specification of germ cells. In addition, we observed that in RCB-ablated embryos, the g blastomere loses its characteristic morphology as well as the cell cycle delay that follows its specification at the eight-cell stage . This observation further supports our finding that the RCB is required for determination of the germ cells. The functional definition of germ plasm is that it is a localized cytoplasmic content that is both necessary and sufficient for specification of the germ line. Here we have shown that the RCB is necessary for germ line specification. Based on the loss-of-function experiments presented here, we conclude that we have identified a putative germ plasm in Parhyale. To test the sufficiency of the RCB in specifying the germ line, future experiments will require transplanting this cytoplasmic region to ectopic locations in the one-cell embryo or to early cleavage stage somatic blastomeres, and then examining the developing embryos for induction of ectopic germ cells. In addition to a loss of germ cells, we found that removing the RCB affected somatic cell function. Specifically, live imaging revealed that embryos did not form a rosette, the cluster of cells composed of Mav, ml, mr and g blastomere descendants that is formed just prior to gastrulation. The rosette cells are the first to ingress during gastrulation, and we found that gastrulation did not occur in RCB-ablated embryos. This result was surprising since it had previously been shown that when the g micromere is ablated, a rosette composed of Mav, ml and mr descendants still forms and gastrulation proceeds normally . 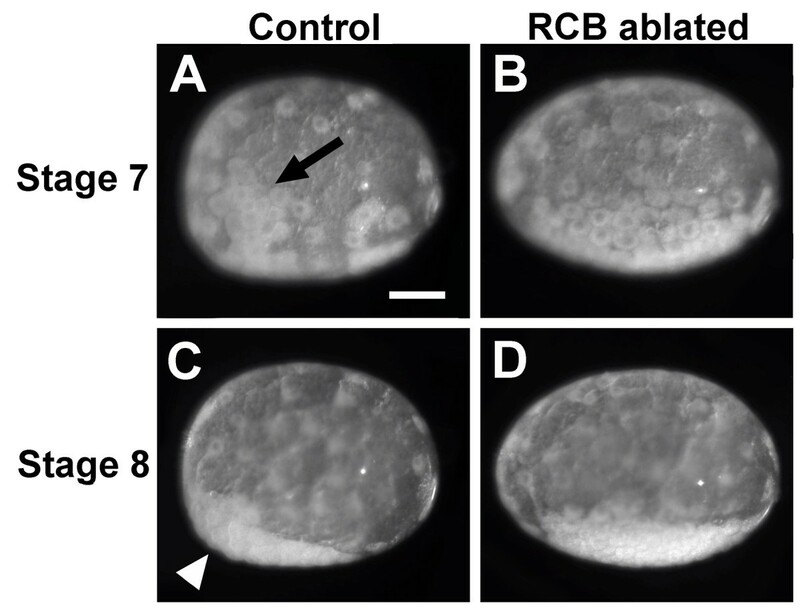 This indicates that it is not the RCB ablation-induced loss of germ cell fate that causes rosette formation or gastrulation to fail. It is possible that descendants of the g micromere, which are still physically present but whose lineage is altered by ablation of the RCB, interfere with the formation of the rosette. Alternatively, it is possible that the RCB has a general function in cell fate specification and that determination of all germ layer lineages is lost. We believe that this is unlikely since the micromere descendants still migrate ventrally and the cells coalesce to form a germ disc. Rather, we suggest that the RCB is required not only for germ line specification, but may also be independently required to specify additional somatic cell fates, possibly at the first and/or second cleavages to specify the sublineages in the two- or four-cell embryo from which g will arise. Additional roles for germ plasm in patterning animal embryos are not unusual. For example, in Drosophila, seven of the nine 'posterior group’ genes, which are required for anterior-posterior patterning, are also required for pole cell formation . Interestingly, we also noted that while a germ disc forms in RCB-ablated embryos, it does not become localized to the anterior of the embryo as in control embryos. This phenotype may be secondary to a loss of the rosette, which in wild-type embryos marks the anterior end of the future anterior-posterior axis of the embryo , or it may represent an additional function for the RCB similar to the function of germ plasm in Drosophila anterior-posterior polarity. To further characterize the function of the RCB, it will be necessary to identify additional molecular markers of somatic cell lineages and to perform lineage analyses of these cells in RCB-ablated embryos. The data presented here describe a distinct cytoplasmic region at the cortex of the one-cell Parhyale hawaiensis embryo that we have termed the RNA-containing body (RCB). We show that the RCB can be identified by its morphology and by the presence of germ line-associated RNAs. Ablation of the RCB results in a loss of embryonic germ cells and a failure to gastrulate, due to aberrant somatic cell behaviors. These data support the hypothesis that the RCB has a putative germ plasm function with additional roles in somatic cell fate specification. This work provides the first functional analysis of a putative germ plasm in a crustacean and will be important for future comparative studies of germ line determination. We thank Friedemann Linsler for reagents, Frederike Alwes for help with data analysis, and members of the Extavour laboratory for helpful discussions of the data and comments on the manuscript. This work was supported by an Ellison Medical Foundation Young Scholar award (AG-NS-07010-10) to CGE. TG proposed the idea for the research, designed and performed the experiments, analyzed the data, and wrote the manuscript. CGE analyzed the data, revised the manuscript, and obtained funding for the research. Both authors read and approved the final manuscript.